Coelenterates (Phylum Coelenterata or Cnidaria) include jellyfish, anemones, corals, and hydras. The phylum is characterized by a gelatinous body, tentacles, and stinging cells called nemadocysts. Most species are found in marine waters, but some occur in brackish or even fresh water. Coelenterates may be either sessile or free swimming, depending on the species and/or stage of the life-cycle. Standard methods of introduction include ship fouling or transportation in ballast water of ocean-going vessels. Potential impacts include competition with native species for suitable substrate or food, negative effects on organisms to which they attach, utilizing native species as a food source, and "swarming", where thousands of jellyfish mass in an area and can affect the local fauna. 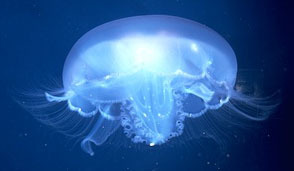 An example of an introduced coelenterate is the Black Sea jellyfish, Maeotias inexspectata. These small purple jellyfish were introduced via ballast water from Russian ships into San Francisco Bay in 1993. They under went a population explosion and infested tributaries of the bay. This outbreak caused considerable public alarm and inspired news headlines like "Jellyfish Jam the Petaluma River".